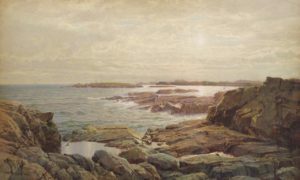 William Trost Richards, The Rocks at Newport, Rhode Island, 1881, gouache on paper, private collection. Landscapes tell stories about place, history, and belonging, capturing the beauty of the world around us. Discovering New Beauty: Watercolor Landscapes of the Northeast examines the varying landscape of the Northeast over the last hundred or so years. Drawn largely from the Lyman Allyn’s permanent collection, this exhibition includes watercolors of the forest, fields, hills, shoreline, and sea. It also explores the built environment, with urban and suburban scenes that reflect on changing demographics. The exhibition looks at watercolor as a medium, exploring different artists’ techniques and considering how the quick-drying pigments are useful for artists working outdoors. 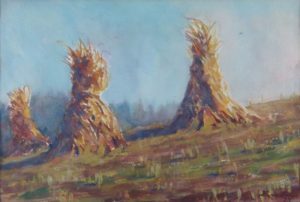 Left: Bancel LaFarge, Cornstalks, 1933, watercolor on paper. 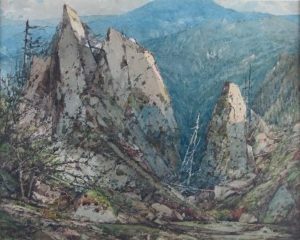 Lyman Allyn Art Museum, gift of Mrs. Bancel LaFarge, 1943.462; Right: William Louis Sonntag, Sr.,Rocks and Mountains, ca. 1880s, watercolor on paper. Lyman Allyn Art Museum, gift of Frederick A. Moore, 1956.82. 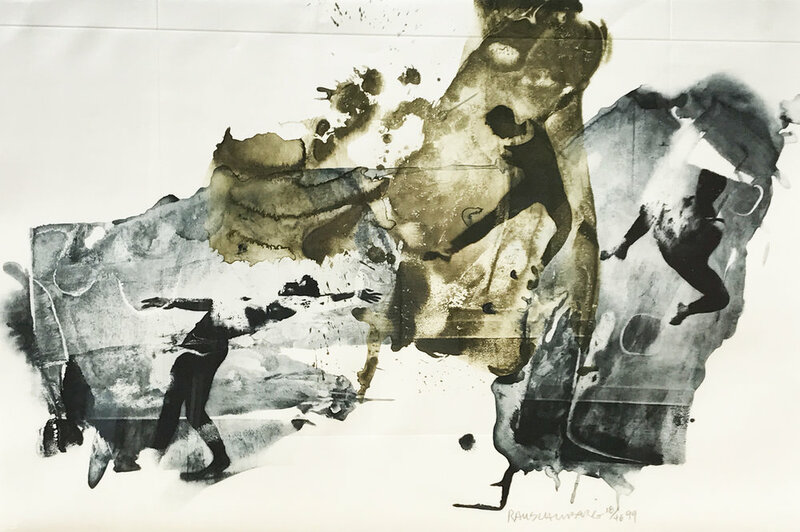 Robert Rauschenberg, Ace from Ruminations, 1999, photolithograph. Mattatuck Museum; Purchase, Acquisition Fund, 2017.12.1. During a career that spanned more than five decades, Robert Rauschenberg (1925-2008) reshaped art in the 20th century, ushering in a new era of postwar American art. In 1964, he became the first American and youngest artist to win the prestigious Venice Biennale Grand Prize. He was also the first living American artist to be featured by Time magazine on its cover. Ruminations is a print series of nine works published by Universal Limited Art Editions (ULAE), West Islip, New York, that includes images of important figures and events from the artist’s young life. Rauschenberg always provided a sense of his personal being through his work, but this series is rare for its directness. Although what the content implies is ambiguous, it is clear that these images are introspective representations of those figures and moments that were important to him. He returned to the more restrained gray palette used in prints from the 1960s and depicted scenes from his childhood including his parents Ernest and Dora, his sister Janet, his former wife Susan Weil and their son Christopher, Steven Paxton, Cy Twombly, John Cage, Jasper Johns, Tatyana Grosman, Leo Castelli and Ileana Sonnabend.